A stunning boutique hotel, One to One Hotel – The Village in Abu Dhabi radiates warmth and charm. This elegant hotel suits the needs of both business travellers and leisure tourists. It enjoys a good location in the heart of the city and features a contemporary décor. With 127 guestrooms, amazing dining venues and classy meeting halls, One to One Hotel – The Village is one of the most sought after properties. Nestled in a lovely low rise building in locally inspired architecture, this hotel offers five exquisite restaurants serving cuisines from around the world. The outdoor pool, sauna and fitness centres provide avenues of relaxation. Shuttles are available to airport. The property is in the heart of the city next to the Al Salam Street. The iconic Abu Dhabi National Exhibition Centre is just 15 minutes from here. 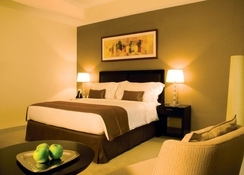 One to One Hotel – the Village is just 25 minutes away from the Abu Dhabi international Airport. 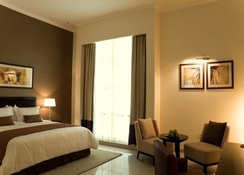 The 4-star property is at close proximity from Al Nahyan Stadium and Al Wahda Club. 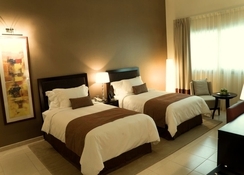 Just at 10km from the Mangrove National Park, this hotel offers easy access to many tourist attractions. The famous Abu Dhabi beach is also at 8km from the hotel. 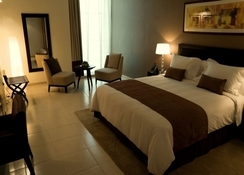 127 luxurious and elegant rooms featuring LED televisions and minibars offer you a pampering stay. 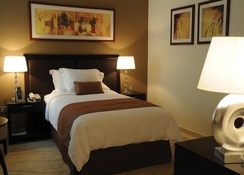 The rooms have complimentary Wi-Fi and satellite connectivity. The bathrooms feature bathtubs and showers with complimentary toiletries. One can also find work desks and safes in the rooms. These upmarket rooms are set in clusters of 15 with shared rooftop pools. Guests can avail room service 24/7. The rooms are all set amidst scenic palm trees. The neutral shades of brown and beige give the rooms a very soothing ambience. One can find contemporary wooden furniture and modern lamps in each room. Guests can sample various delicacies from the five trendy restaurants here. A rooftop eatery serves Italian fare. A tranquil café offers the perfect venue for light chit chat with friends over coffee. Quench your thirst with some of the finest beverages concocted at the bar/lounge here. Guests can even avail the buffet breakfast for a fee. Dip in the inviting outdoor pool or relax with a pampering sauna bath at One to One Hotel – The Village. A health club offers all the modern equipment. Babysitting services can be hired if you wish to venture out alone with your kids.